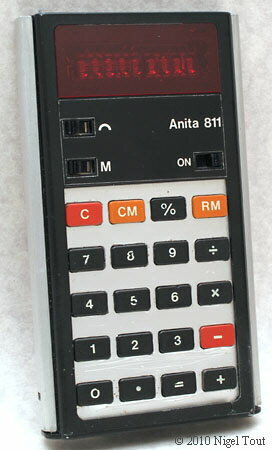 The ANITA 811 was the first ANITA hand-held electronic calculator, launched in 1972. Display: 8 digits, red LED. Functions: 4 functions, %, memory. Batteries: 4.5v (3x AA cells). Integrated circuit: Rockwell A1030PE, in this example date coded week 48 1974. Size: 69 mm x 118 mm x 24 mm (2.8" x 4.7" x 1"). Introduced 1972, price £75 [about $175]. The switch position that is marked with a semi-circle indicates that the answer will be rounded to 2 decimal places. 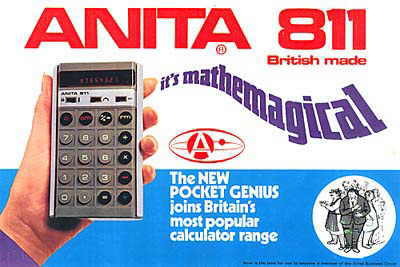 This was the first Anita hand-held calculator put on sale. The story of the development of the Anita 811 and the version for Triumph-Adler is described in "The Rockwell Connection" on this site. 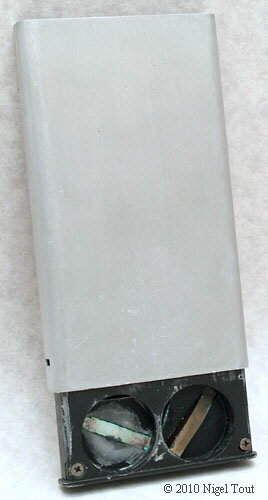 The picture on the left demonstrates how the rear aluminium cover slides up to replace the batteries in the back, which is common to all models of this series. Note that the model illustrated here is a variety with a white painted rear cover. 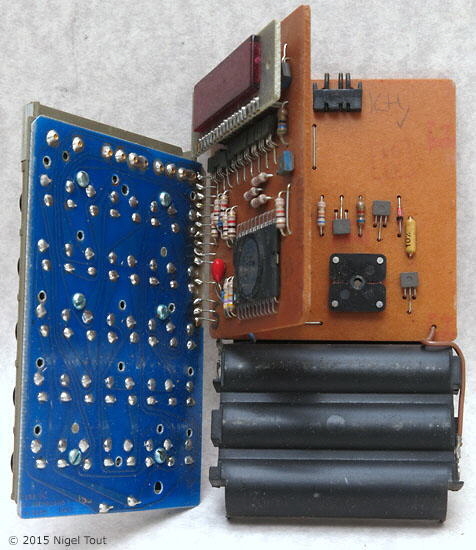 The calculator has two circuit boards, besides the blue keyboard. 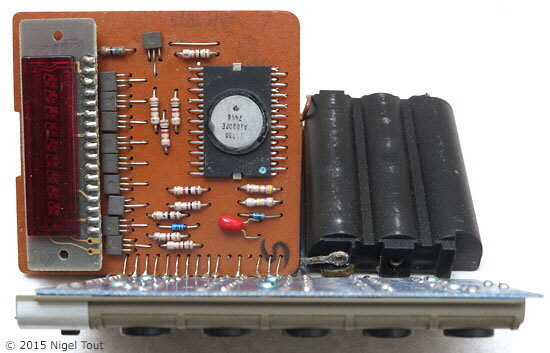 The circuit board underneath has components of an oscillator. 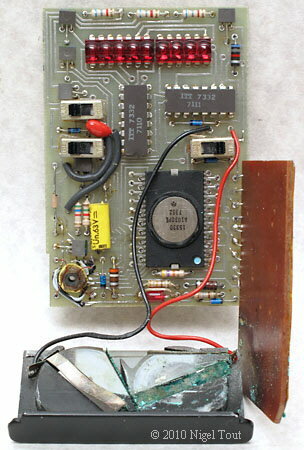 Close up of the top circuit board showing the Rockwell Rockwell A1030PE integrated circuit (here date coded 1974, week 48). Advertisement for the Anita 811. Note the Anita logo in the centre which was in use around this time. Announcing its first pocket calculator, Sumlock Comptometer Limited have unveiled the ANITA 811, a powerful unit with accumulating memory and advanced automatic and design features found in few other machines of its type. Selling at £75 the 6oz ANITA 811 was designed in Britain, and high volume production at the Portsmouth factory marks an all-out challenge at home and overseas in the fast-growing pocket calculating market. The decision to distribute the calculator through normal trade channels marks a notable exception to the policy of direct sales which the company has adhered to until now." Versions of this calculator were also supplied to the Litton Industries subsidiary TA Vertriebs, of Germany, as its Adler 81 and Triumph 81 models. Batteries: 3v (2x PX-825 button cells). Integrated circuit: Rockwell A1030PE, date coded week 52 1973. Size: 64 x 114 x 14 mm (2.5" x 4.5" x 0.6"). The ANITA 811 illustrated here may be a prototype since many of the parts are modified and hand assembled, and some of the plastic parts are painted black. It is thinner than the standard model, has a different style of keyboard, and uses PX-825 alkaline button cells (1.5v, 23 mm (0.9") diameter, 6 mm (0.25") high). The main integrated circuit has a date code for late 1973, so this calculator was not made till over a year after the standard ANITA 811 was launched. If you have any information about this model please get in touch. Grateful thanks to Guy Ball "mrcalc" for the opportunity to acquire this very interesting model. 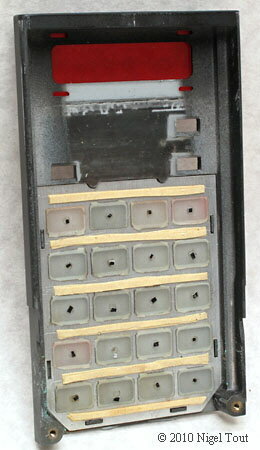 Sliding the metal back of the calculator upwards reveals the battery compartment with cavities for two PX-825 alkaline button cells. 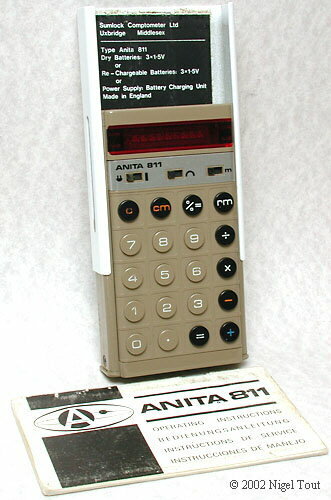 Side view, showing that this model is thinner than the standard model ANITA 811. The rear of the front of the casing showing strips of masking tape stuck on to form separators and little blocks on the backs of the keys so that they reach the metal contacts properly. The casing is made of a light-coloured plastic which has been spray painted black. At the bottom-right of the circuit board is the Rockwell A1030PE integrated circuit, date coded week 52 1973. The keypad contact assembly has been lifted out of the way, on the right. "FIRST POCKET CALCULATOR FROM SUMLOCK COMPTOMETER", Electronics Today International, June 1973, p7.